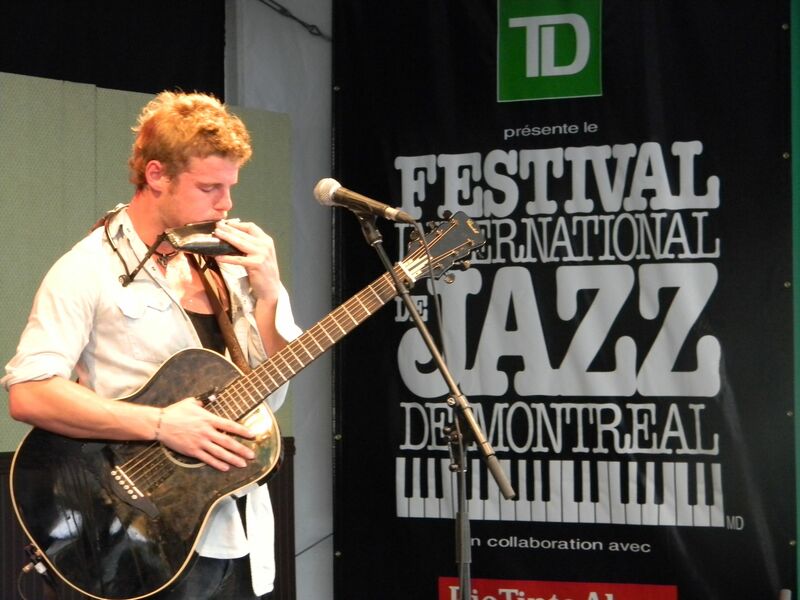 We arrive at the Montreal Jazz Festival for five blissed-out days and nights of music. The extraordinary lineup from June 24 to July 4 has something for all ages and musical genres – it’s a star-studded celebration. 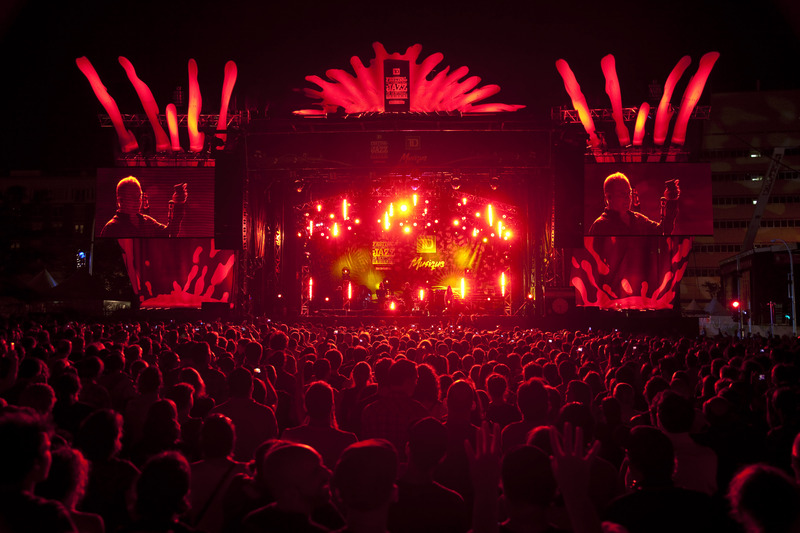 From morning performances for kids to late nights at L’Astral, this is the biggest, hippest and most peaceful music festival in the world – just ask the Guiness Book of Records. 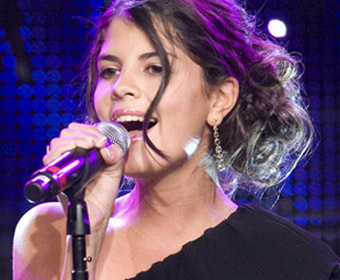 Our first “big event” is Montreal’s own Nikki Yanofsky and a sell-out crowd of her fiercest admirers and dewy-eyed fans. Nikki debuted at the festival five years ago and delivered an astonishing be-boppin’ performance as a 12-year-old. Today, her “backup band” – the 50-piece L’Orchestre Metropolitain – warms up an enormous crowd whose enthusiasm stretches three tiers high. Nikki slams into “I’ve Got a Crush on You” with a sound as big as Saskatchewan. Between sets, her baby speaking voice is a surprise. “Awesome!” she chirps. She’s adorable, gracious, and talented, delivering her flawless “Bienvenue Dans Ma Vie” in French to the delighted Francophone crowd. She then proceeds to kick the Beatles’ “Oh, Darling” clean out of the park. We missed the phenomenal sold-out tribute to the late great Bill Evans with four of Montreal’s finest musicians, Michel Donato on bass, saxophonist Frank Lozano, drummer Pierre Tanguay, and amazing pianist Francois Bourassa. Word on the street: magnifique. 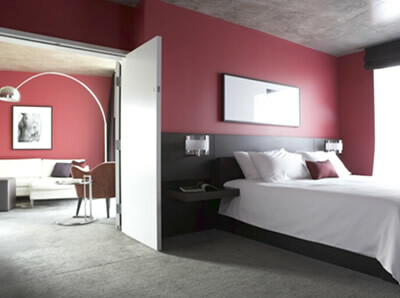 We stayed at the OPUS, an upscale boutique hotel on the corner of Sherbrooke and St. Laurent, steps from the jazz festival, Place des Arts, and minutes from Old Montreal. The OPUS combines modern design and chic Montreal style – we loved our black and white room, and everything we needed was within easy walking distance. OPUS is also known for the late-night hipster scene at Koko bar – and there is a velvet rope. Complimentary cocktails made us feel more like VIPs, but the kitchen closes early (midnight), and you may get a little wobbly. Koko is packed with fashion-forward hipsters, so be warned – unless this is your demographic and you can hold your liquor like Hemingway, find another spot for the wee hours. Aussie guitarist Kim Churchill ripped up “Shoulda Quit You” by Led Zeppelin and received an overwhelming ovation. We caught his set three nights in a row and never tired of his muscular guitar, surfer-boy looks and bare feet, coo coo ca choo. This singer-songwriting-one-man-band from Downunder got our attention – we’ll be tracking his career and hoping to catch another thunderous performance sometime soon. Bluesman Alex Wilson is another up-and-coming guitar master who manages to blend the bluesy sound of Muddy Waters and Jimmy Page with the dazzling guitarwork of Jimi Hendrix. Alex has talent to burn so do check him out. The after-hours outdoor concert scene is highly recommended. You’ll see acts and performers that will delight and astonish – and best of all, for free. 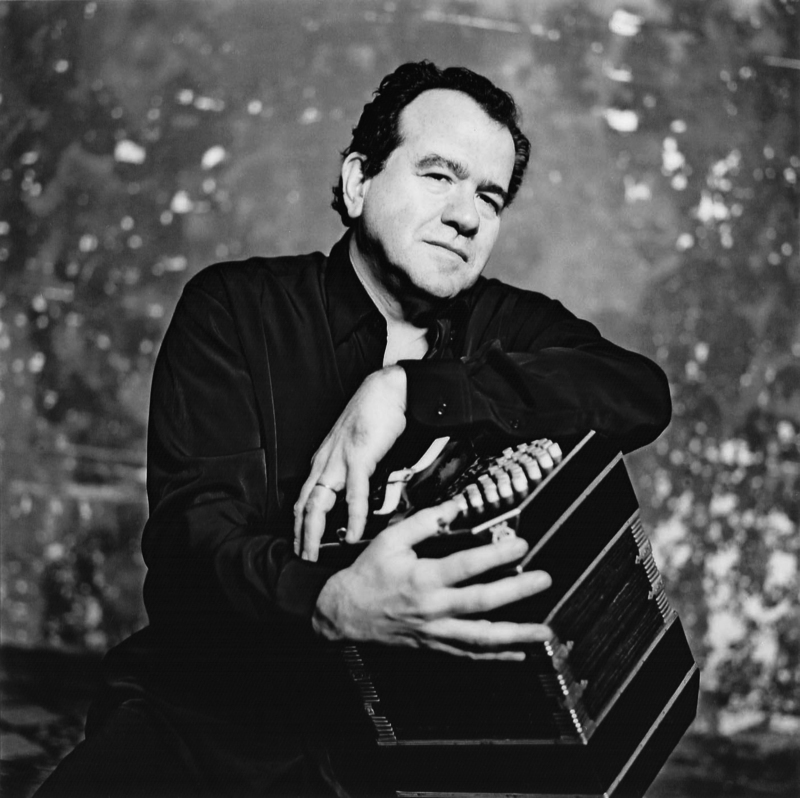 The French-Cuban duo of Richard Galliano on accordion and Gonzalo Rubalcaba on piano perform Piazzola tangos, jazz rhythms and melancholy compositions like “Oblivion.” Sometimes dark but always soaring, this seamless musical collaboration ignites sparks. 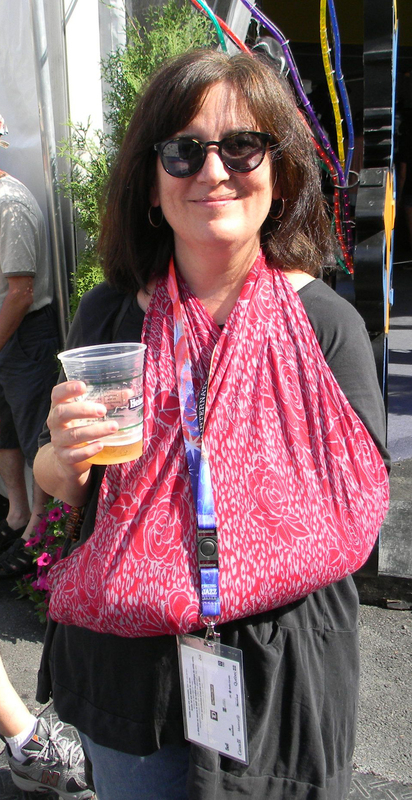 Ouch: Somewhere between Nikki Yanofsky and Gonzalo Rubalcaba I broke my arm. But even that didn’t dampen my enthusiasm or appetite – see below. A restaurant meal can provide respite from cold, rain, or blistering sun. 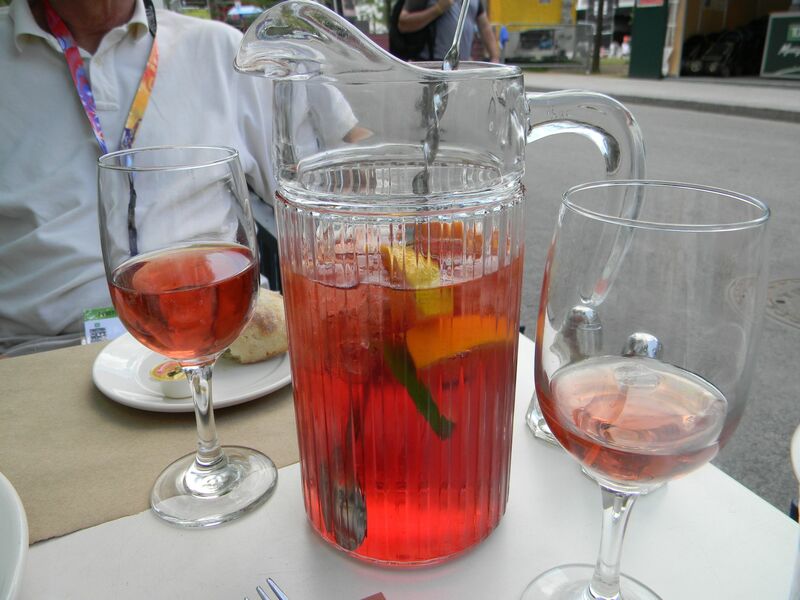 This year we had perfect weather, however – not too hot, not too cold – just right for hanging out on the Place des Arts. So between all this musical magic we decide to sip, savor and explore the gustatory offerings onsite. Le Balmoral Bistro represents the high end of onsite dining. Try the the Caesar salad with shaved parmesan, anchovies, bacon, and giant caperberry. 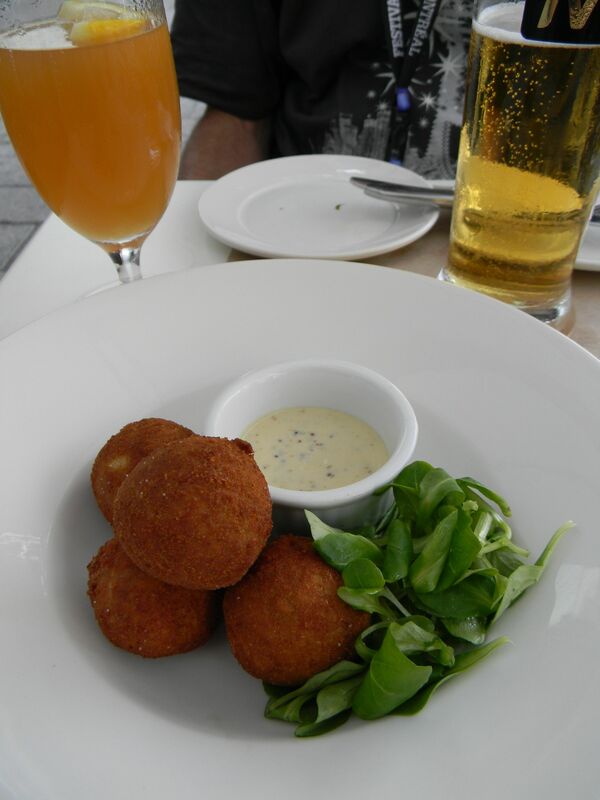 The Stanstead rabbit confit-style croquettes with Dijon dipping sauce are rich, dense, flavorful and local. The grilled hamburger was a bit of a disappointment – we found we fared better (and cheaper) on the appetizer menu. Balmoral shared their recipe for refreshing rosé sangria with two of our favorite flavors – Cassis and Campari – delicious. 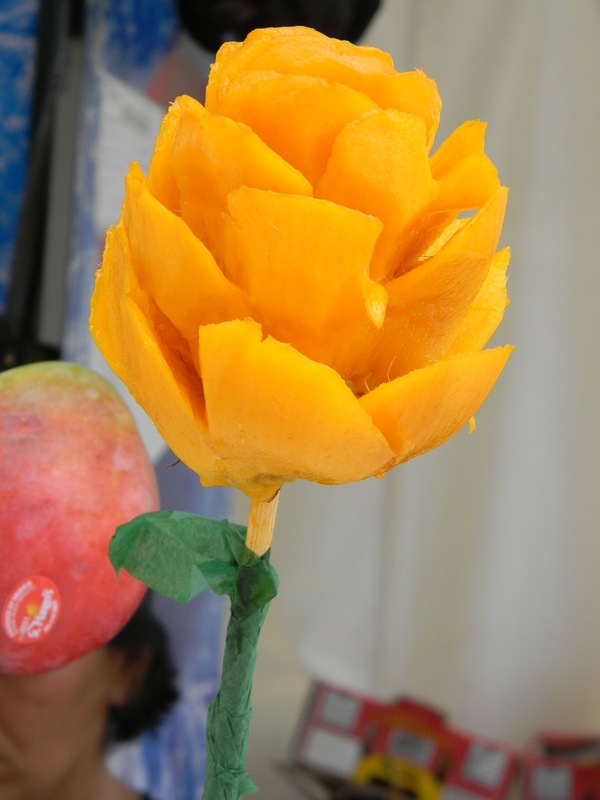 Colorful mango flowers on a stick are a great way to rehydrate, and they’re cute. A funky taco truck offers pulled pork and vegetable tacos,indescribably messy and delicious. 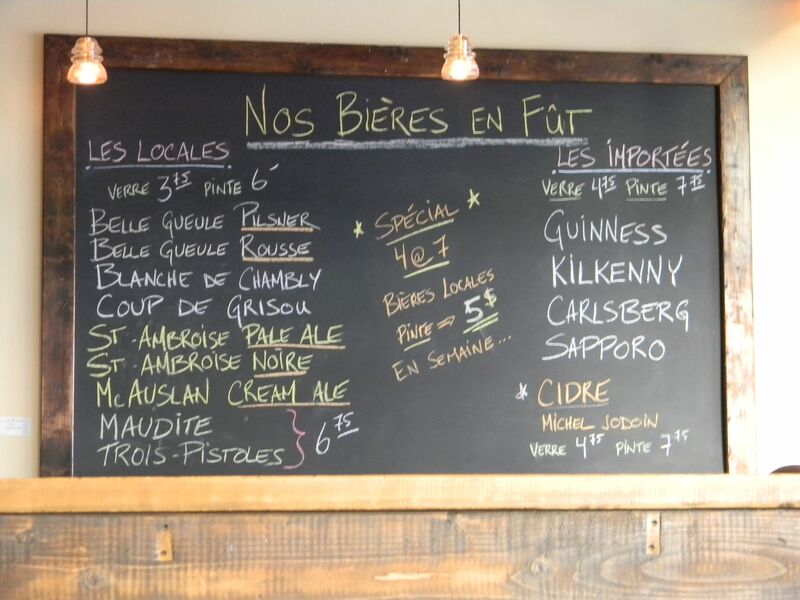 (They offer a crab taco too, but bear in mind that Montrealers have a love affair with mayonnaise.) Surprise! The onsite hotdogs are outstanding. Nyk’s, just a heartbeat offsite, is a friendly alternative when you can’t manage one more beer in an S.A.Q. tent. Nyk’s beer selection is extensive, servings are messy but generous, service is good humored – but if you have concert tickets, make sure you watch the clock because they won’t. 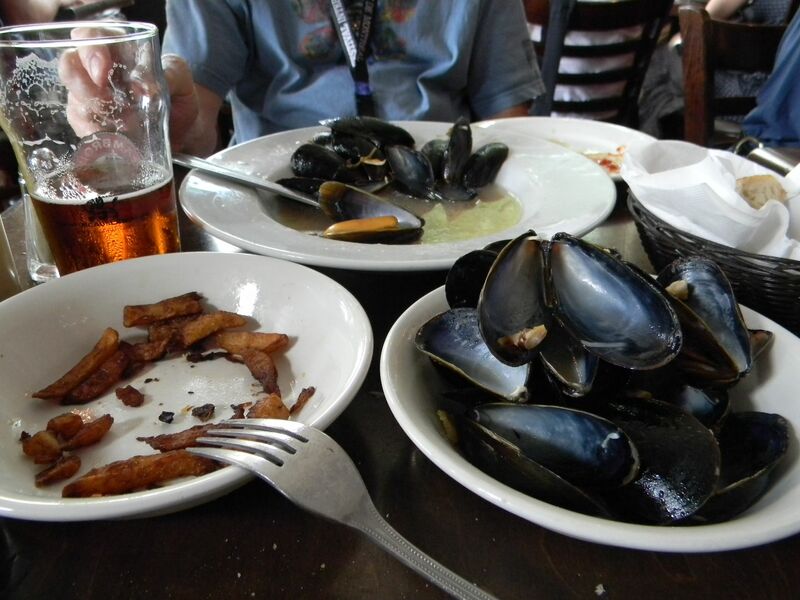 I’d recommend the moules et frites as an authentic Montreal flavor – and tasty, to boot. Plenty for two. 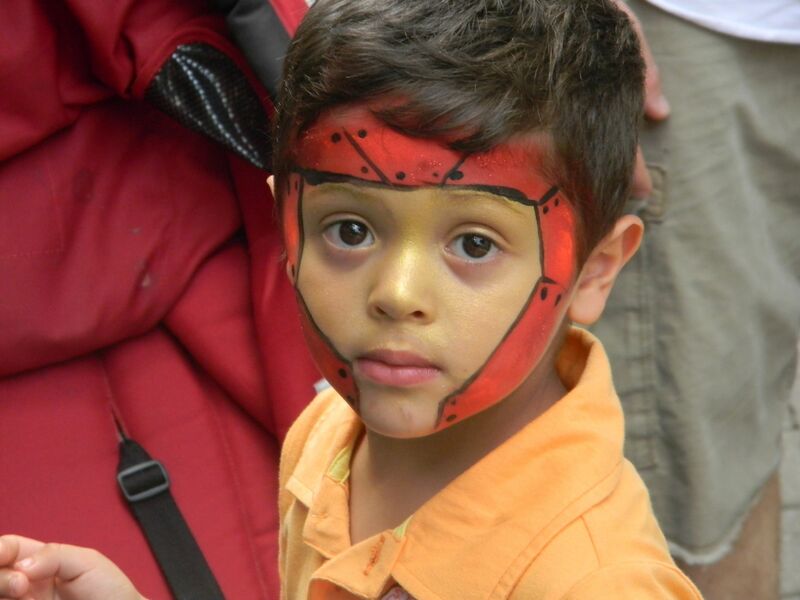 This festival engages and entertains all ages. Kids are as blissed out as their parents. Music is the main event: children boogie, twist, wiggle, and shout – and their parents share the joy. The closing event features legendary party band, the B-52s. The temperatures are balmy and it feels like a pleasant night aboard ship … with 100,000 other people. The B-52s open like a runaway train with “My Own Private Idaho.” Kate and Cindy, in shades and up-dos, belt out “Love Shack” and their beloved platinum hits (Rock Lobster) with bounce and verve – they really deliver. Their classic songs are anthems, as familiar as suburban angst and shopping malls. A perfect way to spend the 4th of July. Outstanding fireworks! 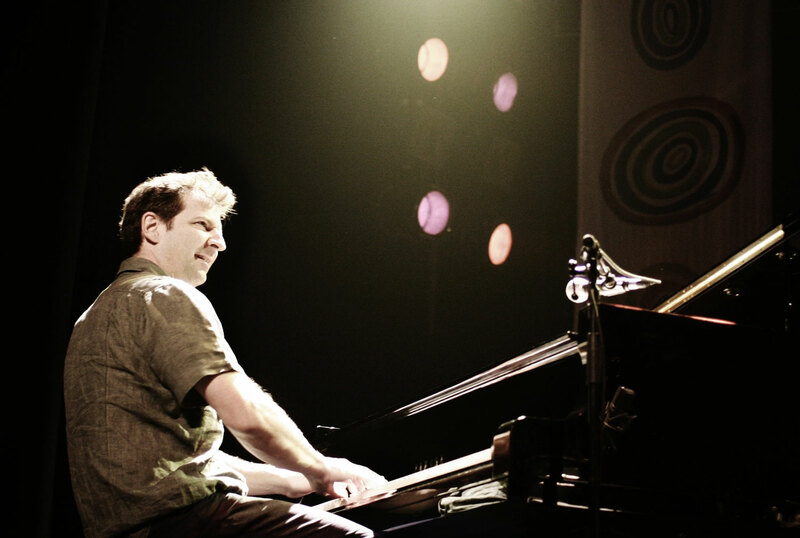 This entry was posted in Food and Wine, Music, Travel and tagged ALex Wilson, B-52s., Bill Evans tribute, Francois Bourassa, Frank Lozano, Gonzala Rubalcaba, Kim Churchill, Layla Zoe, Michael Donato, Montreal Jazz Festival, Nikki Yanofsky, Nyks, OPUS Hotel Montreal, Pierre Tanguay, Richard Galliano, S.A.Q., Sophie Hunger, Susie Arioli. Bookmark the permalink. This is such a brlliant , delcious, comprehensive, musically savey report on this festival, I think you need to take me with you next year!!! Coo coo cachoo, is right!!!! One of our all time favorite songs, ” Just the way you look tonight”, would have made me cry! 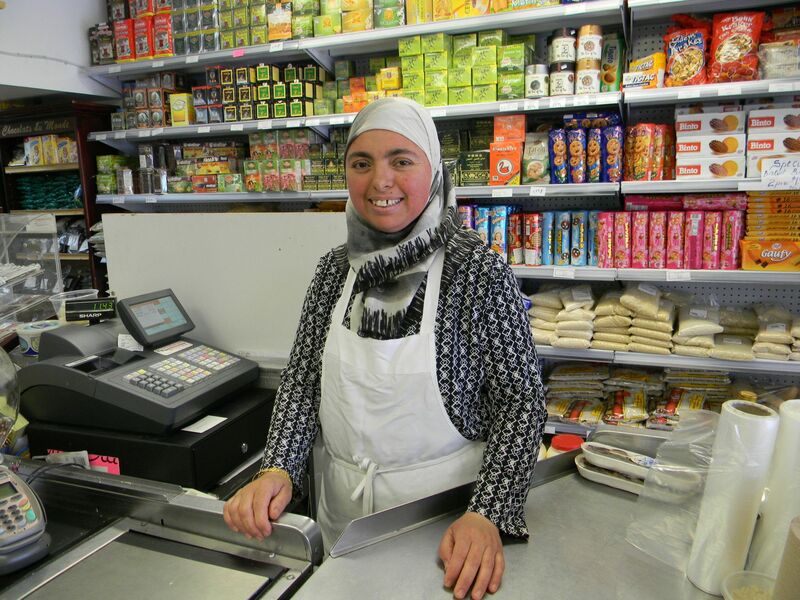 Wonderful, Libby and David, wonderful report and photos, and we thank you, thank you! Bring me along, too! Really great read. Photos are fab! And you look chic even with a sling! 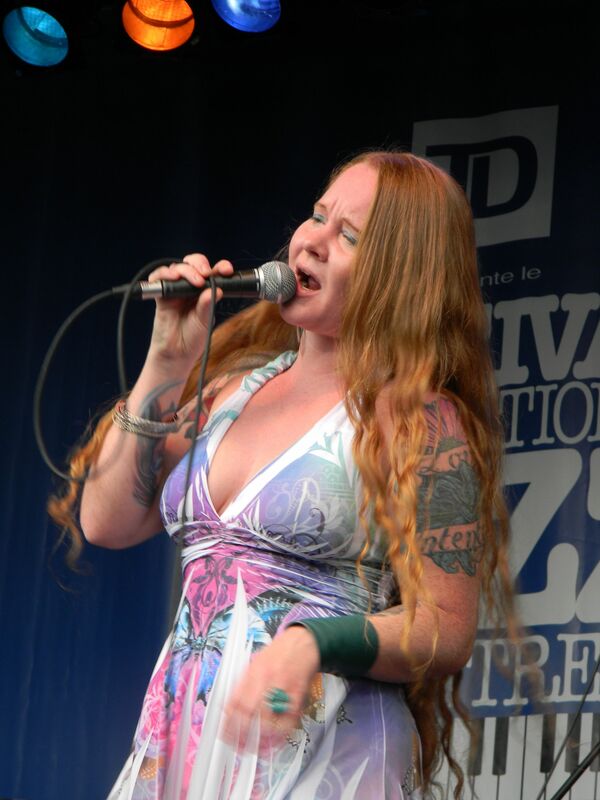 Does Layla Zoe look like Janis Joplin in person? She looks like her.